Metabolt, the 3rd-party text-based client appears to have ceased development, this time possibly permanently. Rumours that development work on the client had ceased first arose in late 2013, after an extended period which had seen no updates or releases. However, in February 2014, news circulated that CasperTech were set to take over the curation of the project and continue it in the spirit in which it had been started. 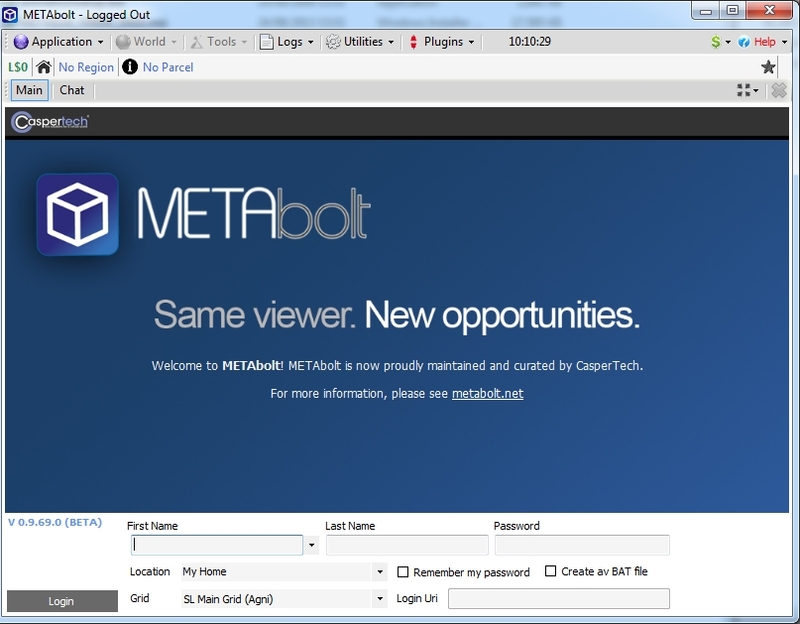 The updated METAbolt log-in / splash screen from February 2014 gave the first indication that Metabolt would be continuing after several months of what appeared to be suspended development. The announcement was followed in June 2014 with an update to the client – version 0.9.71.0. However, since then, there haven’t been any further releases, which had again left some wondering if the client was still being actively developed. Obviously, whatever arrangement (if any) had originally been reached between CasperTech and the original developer on how the client might be continued under its original branding is a matter for the two parties concerned, and not something for idle speculation. However, given a disagreement has now arisen on the matter, then as the CasperTech announcement states, this would appear to be the end of the line for the client in its current form at this point in time. As can be seen from the notice, CasperTech are intending to issue an alternative client in the near future, although no time frames appear to be available at the time of writing this article. I’ll of course provide a review of any new client from them once it does appear. METAbolt is a lightweight text-based client for Second Life and OpenSim offering a range of features and capabilities. At the start of the year, there had been concerns that due to the long delay between updates (the last being August 2013), work on the client had stopped. However, as I reported in February, this was not the case, but rather CasperTech were stepping-in to take over the project, as was announced on the METAbolt website at the time. While it has taken a while for things to move forward since then, the initial interim updates from CasperTech have now started to appear. As this release resulted in an issue with METAbolt plugins, June 14th saw the release of version 0.9.71.0 (release notes) which, as well as fixing the plugins problem, also added a digital signature to the installer to prevent any security warnings from popping up on download. Both of the releases present METAbolt as an installer .EXE, rather than packaging them as a ZIP file containing the installer and support files, as with previous versions. A little more work is required on cleaning-up some elements, as the installer does still refer to “METAbolt (64 bit)” and defaults to naming the installation folder “METAbolt (64 bit)” under Program Files (x86). However, this is purely a cosmetic thing, and not something that interferes with using the client. Given the focus with these updates is on under-the-hood changes, the look and feel ofMETAbolt remains largely unchanged from earlier recent releases, other than the revised log-in / splash screen. 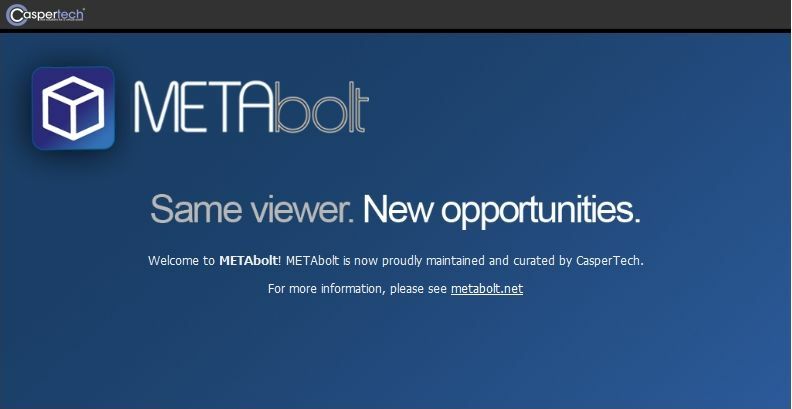 Which is not to say additional work isn’t already underway.Tom Mettam, now leading the METAbolt project indicates that there is a major code refactor underway; as a part of this, CasperTech apparently plan to offer “bounties” for people willing to assist with the work. Those interested are advised to keep and eye on the Issues section of the METAbolt GitHub tracker for more information. While I have not covered every release of METAbolt through this blog, those unfamiliar with the client may want to read my initial review, mush of which still appears to be relevant, and check the METAbolt category of this blog for those updates I do have. There have been concerns and rumours circulating about Metabolt, the text-based client for Second Life and OpenSim. The last update occurred in August 2013; the long delay coupled with the recent unavailability of the Metabolt website, fuelled rumours that the client was being discontinued. It was recently announced that the METAbolt project was being discontinued. We are very happy to announce that this has not happened, and instead CasperTech have stepped in to curate and maintain the project. CasperTech is a leading provider of solutions for content creators within Second Life. We believe that METAbolt will benefit from our strong legacy and foundations. It is not our intention to commercialise the project, and we will maintain it in the same spirit of open source community collaboration. We do intend, however, to rejuvenate the METAbolt community with active development, support and new innovation. We are very excited by this opportunity, and we hope you are, too! Please bear with us while we complete the transitional period – we’re working on a new website and will be making our first release of METAbolt soon. – Casper Warden, CasperTech Ltd. While the new Metabolt site is being set-up, a link to the download page / source code for the current release of the client is included below the message. 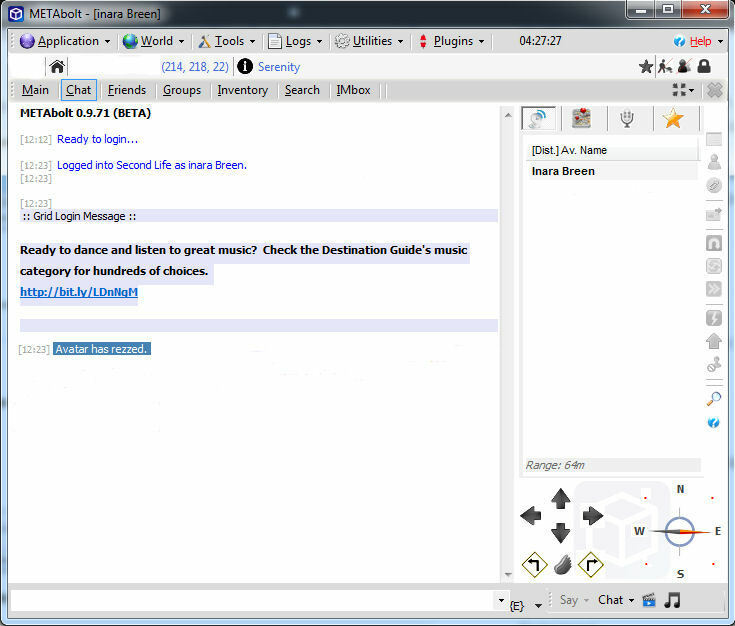 Metabolt is popular text-based client for users of various types of bot in SL (such as the Pandora Bot), which can be used for a variety of role, such as greeters, automated assistants, etc. As such, the news that the client looks set to continue should be warmly received. Metabolt has recently been through two significant updates – and in doing so, has stolen a march on graphical Viewers. With Phoenix and Firestorm due to get “Contact Sets” for managing Friends lists in the future, Metabolt has the capability to sort and group Friends now. LSL API is now activated via the Security tab under Application/Preferences where you need to specify a master avatar and a master object UUID so that commands are only accepted from them. Unchecking the “enforce” option will mean METAbolt will accepts commands from all avatars and objects that pass a valid METAbolt password as it used to be before. Viewer 2 Physics Layer supported (if a physics layer of clothing is worn, movement will render correctly in graphical Viewers). The 0.9.49 release of 3rd September (which obviously includes the 0.9.47 updates) revises the login splash screen to add two new button that are displayed when OTHER is selected from the Grid drop-down list. The first of these will open the grid list in a suitable editor (e.g. Notepad), allowing you to easily add additional grids to the list. The second button will refresh the list to display any new grids you’ve added. Once logged in to Metabolt, 0.9.49 allows you to organise your friends list into Groups using two new tabs and a new drop-down list. 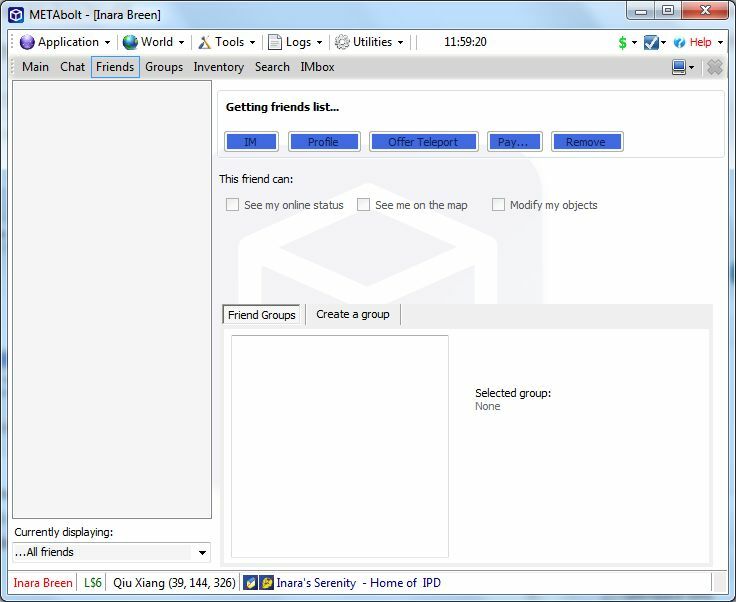 Friend Groups displays a list of groups you’ve created. Clicking on a group will open a box allowing you to drag-and-drop the names of friends from the main list on the left into the Friend Group. Currently Displaying under th you main friends list on the left of the window allows you to display all your friends, or select a specific group you have created via a drop-down list. These are sure to be welcome additions that further enhance Metabolt. Like the Viewer, these “lightweight”, or text-only clients come in a number of flavours, some of which can run on computers and others on mobile devices. Given I don’t have a suitable mobile device, I thought it might be interesting to take a look at the former, focusing on the Windows platform, and given some kind of insight into their features and capabilities for those who have never used them. So over the course of three articles, I’ll be taking a look at Libretto, Metabolt and Radegast – all of which are on the SL TPV Directory, and all are still very much under enhancement. Installation comprises downloading a ZIP file, extracting the contents to a temporary folder and then installing from there, which is somewhat long-winded, but the results are worth it. From the start it is clear that Metabolt is intended to cover a lot of bases, allowing you to not only log-in to Second Life’s Main grid, but also to the Beta aditi grid, and to a number of pre-defined OS grids. You can even define a custom log-in for any grid not on the list, providing you have the necessary login uri. As with a graphical Viewer, you can additionally set your preferred log-in location. 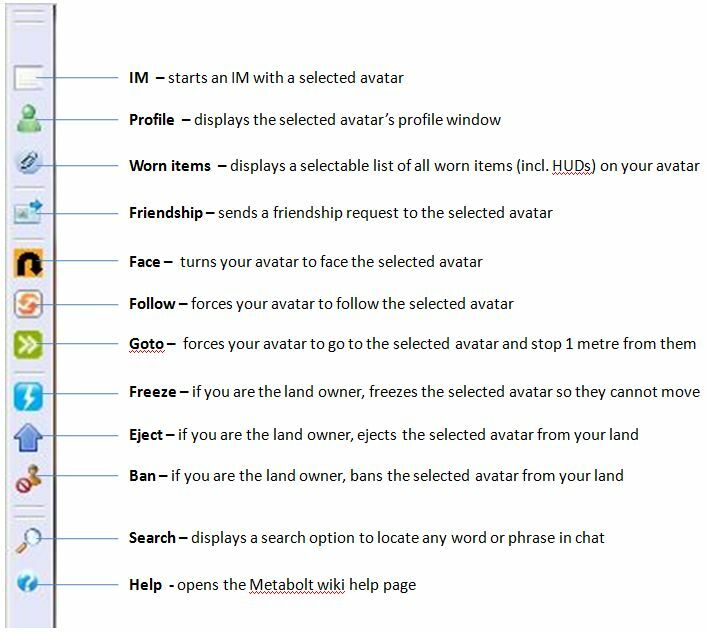 Finally, on logging-in, your avatar’s details are saved by Metabolt & can be selected from a drop-down drop-down list (First Name), simplifying the logging-in process in future sessions. A successful log-in to Metabolt takes you directly to the Chat window (below). World: provides a series of in-world and avatar-specific options, including the ability to animate your avatar (so you can dance if you log-in at a club, rather than standing like a lemon); allows you to Tp Home or set a Tp point where you are, rebake (useful if someone informs you that you are a cloud in-world), go to your account history page at secondlife.com, etc. 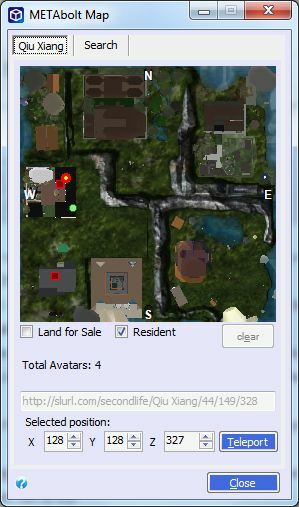 Utilities: Reloads the AIML libraries associated with the AI plugin and allows you to launch the official SL Viewer, if you have it installed. 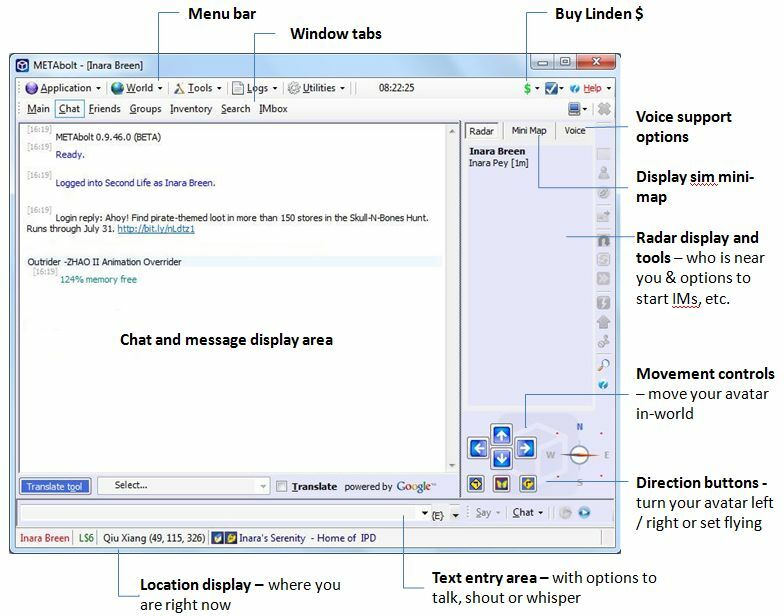 Chat: displays the chat window, show above. IM a friend, view their profile (in a Viewer 1-style profile window), offer to teleport them to you, pay them, or remove them from your friends list. 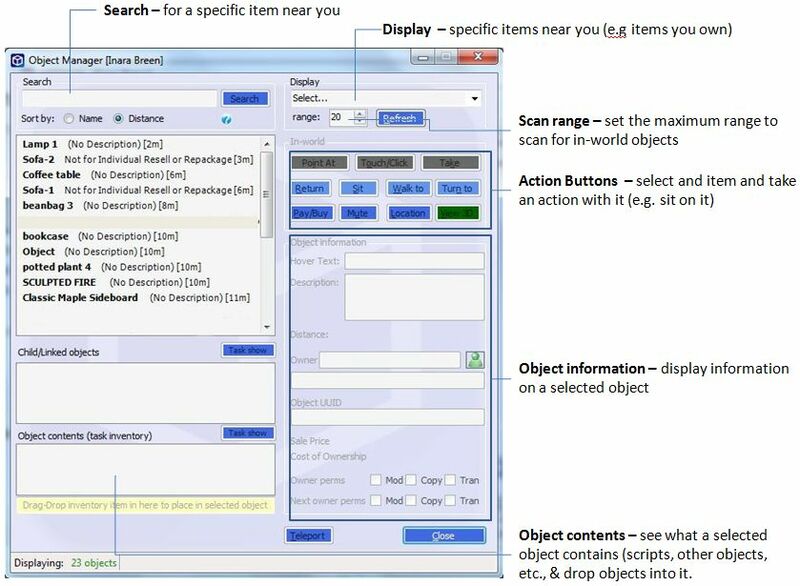 Inventory: is a powerful window that allows you to view, sort and organise your inventory, look at item properties and wear / remove / transfer items, as well a perform a number of other tasks as shown below. IMbox: allows you to review and reply to unread IMs you’ve received from other avatars. Deatch: will detach a selected window tab from Metabolt and display it in its own floater. Use the Reattach option in the floater, or simple close the floater to redock the window with Metabolt. Interact with objects using the In-world tools – walk to an object, point to it, sit on it, stand up from it, mute it, etc. You can additionally view details of a selected object and its child components. 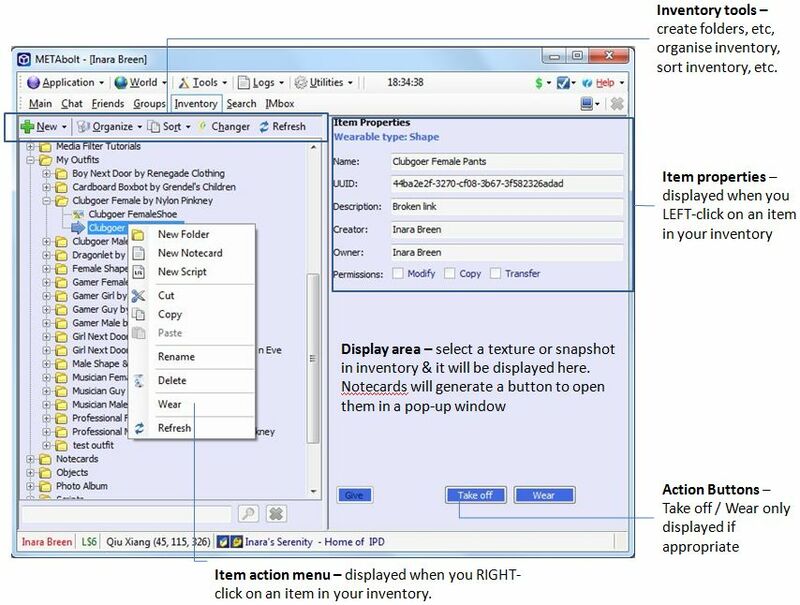 The Object Manager includes a button to touch items around you and which should – I think – bring-up any menu associated with them to allow you to interact with it; however, this option does not appear to work as expected at present: a window is opened for the Touched object, but no actual menu is displayed. Getting friends around you to help direct you as you use the movement keys. Using the radar FOLLOW or GOTO buttons (see below). None of these options – other than teleporting to fixed points – are terribly effective, but can at times help with things, and can be fun to try! A major plus point for Metabolt is that it supports other grids, making it a good contender if you have a presence on several grids and need a text-based client to access them. I tried Metabolt with both InWorldz and Avination – neither of which are on the default list of grids, and logging in to both was as simple as giving my avatar details, selecting OTHER… from the drop-down list of grids and then giving the login URI for the grid to which I wanted to connect. If I have a complaint here, it is that the grid name isn’t added to the list of available grids, so you have to re-enter the URI each time you wish to enter a grid that isn’t listed. 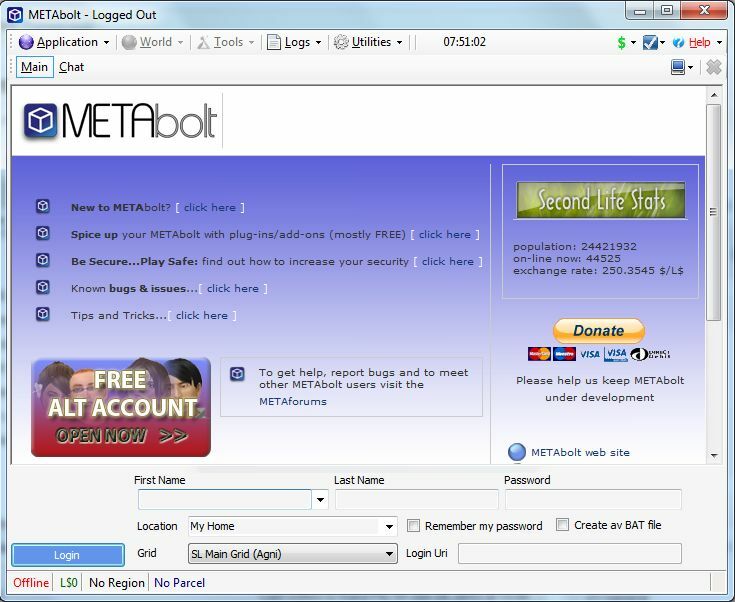 The Metabolt website is very polished and provides excellent support in the form of a set of wiki pages, one of which provides a series of additional plug-ins to the “basic” client, as well as a reasonably-good Help section. 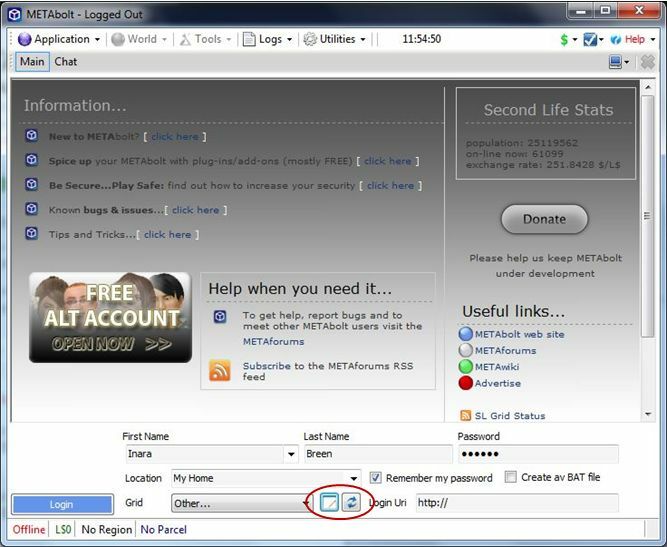 There is also a forum for users as well, which appears to be in reasonable use, suggesting that there is lots of help to be had there from other users, should you need it. Metabolt can appear a little off-putting with the log-in page ads (although there is an option to remove these if you donate to the project) – but don’t let them stop you trying out the client, as it may prove to be what you’re looking for when you can’t use the full Viewer. Despite the apparent complexity of the main window, getting to grips with Metabolt is very easy, and you should encounter few problems in using it for basic tasks. That said, refinement of some of the more advanced options – such as touching objects – is required. I’m personally not convinced of the need to include movement keys – unless there are plans to include some kind of 3D real-time rendering tool, a-la Radegast. I also felt the overall colour scheme could be improved; some of the background colours on the Object Manager buttons might make reading the button labels hard for some people. Sitting on a object was also sometimes touch-and-go due to not being able to define precisely WHERE on an object you might want to sit (unless a poseball is available for selection); but this is an issue for any non-graphical client offering this type of functionality. That said, Metabolt is certainly a more involved text client than Libretto, and can enable you to do a lot more while without full graphical access to a grid. Overall a very good application with an impressive feature list.